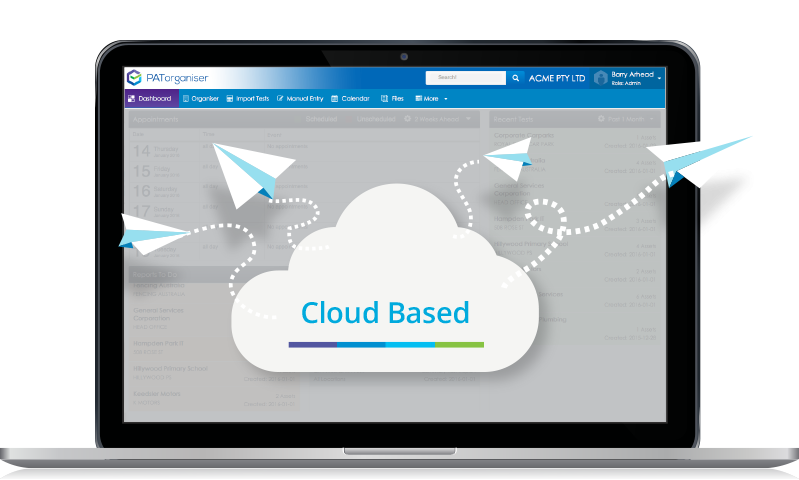 Cloud Based Software – Access PATorganiser anywhere at anytime on any device. PATorganiser is a fresh and innovative approach to PAT management and is the only “Cloud” based software offering of its type. Cloud computing keeps all the files in one secure and safe central location, and everyone works off of one central copy. Your data is completely secure even if your computer is lost or stolen. Cloud based means that as long as you have internet access you can simply access your data anytime, anyplace on any device for complete flexibility. Always stay on top of the latest version of PATorganiser because we take care of all of your PATorganiser software updates for FREE, effortlessly with no need to download. PATorganiser in the Cloud keeps all of your data in one central location, allowing all of your technicians/employees/users to work off of one central copy. This whole process effectively is more secure and saves time. Some 800,000 laptops are lost each year in airports alone let alone how many crash with loss of data but when everything is stored in the cloud, data can still be accessed no matter what happens to a machine.